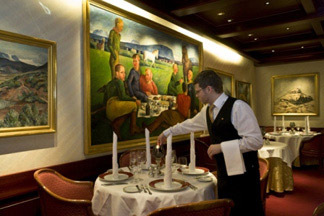 The Gallery Restaurant at the Hotel Holt in Reykjavik, Iceland features French-inspired cuisine where the elegant dining room and fine collection of Icelandic art is the perfect showcase for the innovative culinary creations of Chef Fridgeir Ingi Eriksson. 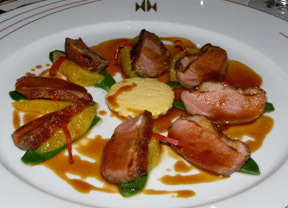 Edward and I had dinner at The Gallery Restaurant in late September 2009 and our high expectations were richly rewarded. Having had a wonderful dinner at the restaurant previously in 2007, we arrived at the restaurant ready to be dazzled, and dazzled we were. 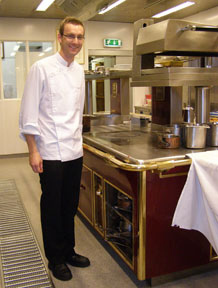 Since we had last dined at the restaurant, Chef Fridgeir, who is a business partner in The Gallery restaurant, had changed the décor and even designed special china to showcase his food. The new look for The Gallery Restaurant features elegant gold window treatments held with gold tiebacks that grace the large windows, the tables are double draped with white linens and gold under linens with crisply starched white ivy print linen napkins rolled into tall candlestick shapes, and are accessorized with new silver and glass pedestal candle holders with tall white tapers. A wood coffered ceiling twinkled with fairy lights and gold sconces illuminated the impressive collection of Icelandic paintings in sumptuous gold frames that line the dining room walls. Our evening began with a delectable amuse bouche of lobster soup with marinated langoustine and white chocolate cream. Paired with Vicar's Choice 2008, Pinot Gris, 13% alcohol, from New Zealand, the amuse bouche was a gorgeous "hello" from Chef Fridgeir Ingi Eriksson that really showcased his creative approach of combining flavors like white chocolate in a lobster soup. 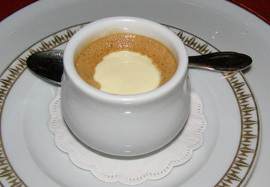 The white chocolate leant a delicate hint of creamy sweetness that complemented the savory elements of the soup. We continued with a perfectly seared scallop that had a golden crust artfully presented on a tapenade bed accompanied by orange bell pepper coulis, a square Parmesan pastry topped julienne zucchini, tomatoes, and rocket drizzled with dressing, and coriander herb oil arranged on a white rectangular plate. This was another course that demonstrated Chef Fridgeir Ingi Eriksson's French training with regards to taste, preparation, and colorful presentation. The next course of steamed flounder under false fish scales with whipped nut oil and vanilla seasoned meat stock is one that is destined to become his signature dish. We gave him high marks for his artistic creativity and melding of flavors that expertly showcase this fish course, which was gorgeously presented with "faux fish scales" that he created using thinly sliced radish and pasta. Visually stunning, the result was impressive and delivered what it promised on the palate with lovely textures from the crisp radish and exquisite sauce to complement the fish. The course was well matched with a Pfaffenheim 2007, Vin d'Alsace, Pinot Gris, France with its aromatic nose and green apples, minerals, and slate on the palate. We went our separate ways for the next course so that Edward could experience the Icelandic duck "orange" from the farm Hlíđarberg, which was elegantly presented as eight slices of duck with perfectly crisp skin on a bed of snow peas and orange with a red wine and orange sauce with julienne orange peel, and accompanied by pan-fried potatoes. Our international wine journey continued with MO 2007, Salinas Monastrell, 14% alcohol, from Bodegas Sierra Salinas, Spain that was a nice companion to this course with its rich, spicy, dark fruit notes on the nose and dark cherries and plums on the palate. 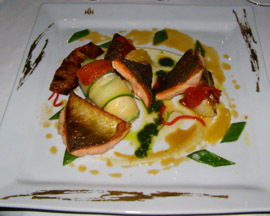 For my final savory course, I had pan-fried artic char that was a colorful modern art presentation of three triangles of crispy skin artic char, a langoustine wrapped in sliced zucchini, with artichokes, pineapple, tomato confit, mashed potatoes, and apricot sauce artfully arranged on a large square white plate with bold slashes of gold. 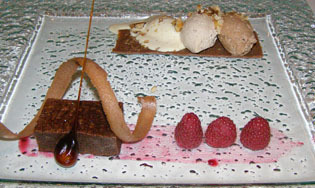 Ending on a sweet note, dessert was seductively presented on a square art glass plate with dark chocolate cream, white chocolate cream, and vanilla ice cream scattered with warm caramelized nuts presented on a bed of chocolate that was flavored with salt, pepper, and spices; and a dark chocolate cake embellished with a chocolate tulle swirl, raspberries, and raspberry jam brushed on the plate. Paired with Château Suduiraut, 2002, Sauternes, 13.5% alcohol, from France, it was the perfect finale to a grand evening of fine dining. Having twice experienced enchanted dining at The Gallery Restaurant, it is easy to understand how passionate Chef Fridgeir Ingi Eriksson is making his culinary mark on the Reykjavik restaurant scene. The Gallery Restaurant is open daily for lunch from 12:00 pm until 2:30, and for dinner from 6:00 pm until 10:30 pm. 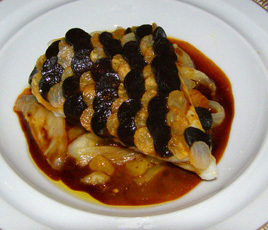 Read about Hotel Holt in the Hotels and Resorts section and in the Chefs' Recipes section where Chef Fridgeir Ingi Eriksson shares a delicious taste of The Gallery Restaurant with his recipe for Flounder Filet under False Fish Scales with Whipped Nut Oil and Vanilla Seasoned Meat Stock in English and Icelandic.